What are your dread extensions made of? 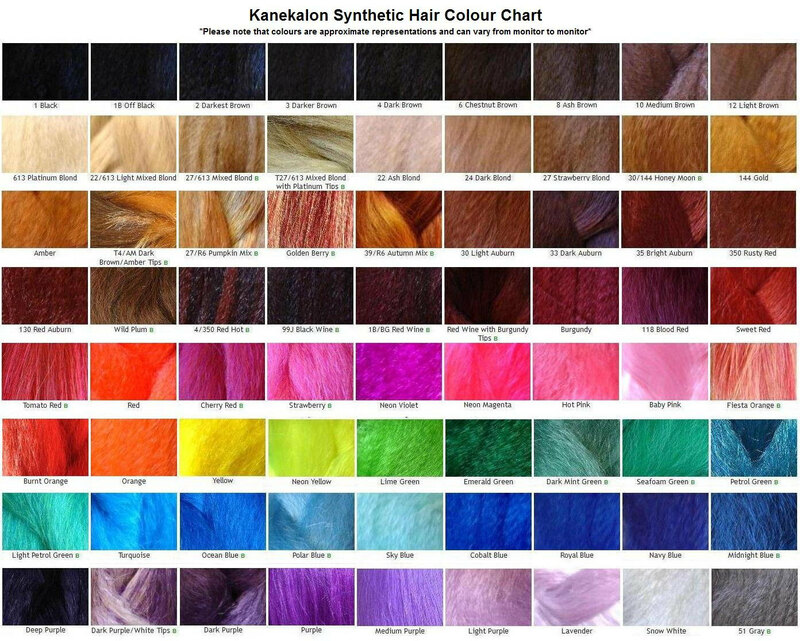 My synthetic extensions are made of 100% Kanekalon and Afrelle (a type of Kanekalon) fiber which looks amazingly like human hair and comes in a beautiful range of natural and bright colours that can be blended. I also make dreadlocks out of human hair and felted alpaca fiber, though the cost is much more and the colour range is more limited. What is the difference between crocheted, knotty, and twisted dread extensions? I ONLY make crocheted and knotty extensions. Each dread is backcombed, hand crocheted, and steamed by yours truly to create a long-lasting and natural looking extension. Most people can't tell the difference between a well-crocheted dread extension and a natural dreadlock (though they are a bit lighter weight and feel a bit different than natural hair dreads due to the material). The bulk of dread extensions you will find available in other shops are merely backcombed and twisted which tend to be cheaper as they are quick and easy to make, but they look nothing like naturally formed dreadlocks and don't tend to last as long. As far as texture, I can either make your dreads smooth or more "knotty" and lumpy/loopy. How many dreads should I order? For a full head of dreads in average thickness (between 1cm and 1/2") installed on average thickness hair, I generally recommend around 50 SE (single ended) or 25 DE (double-ended) dreads. For a fuller look, you may want closer to 60 SE dreads or 30 DE dreads. Some people like HUGE hair and order a lot more (i.e. 80-100 SE / 40-50 DE), but remember that this can get heavy and uncomfortable depending on length and thickness (and can lead to breakage and thinning if your scalp is overly stressed by the weight). Comfort is key if you're wanting to keep them in! How do I know what length(s) to order? Can I bleach or dye my extensions to match my hair? The kanekalon fiber I use is synthetic and resists dyeing. It's best to match your hair colour as best as possible from the get-go. Feel free to send me a photo of your hair (natural light is best) so that I can help suggest a match. I have many natural and crazy colours available (see COLOUR CHART) and I can always blend to match your shade. If colour matching is a concern, you may want to order a few single sample dreadlocks before buying a full set. What is the difference between single ended (SE) dreads and double ended dreads (DE)? What's the difference between tapered and blunt tips? How about loop, tapered, and loose tops? Tapered tips tend to look most natural on naturally straight hair, whereas blunt tips naturally occur more often in curly hair. Loop tops are best for temporary extensions, tapered tops are best for installing permanently at the root, and loose tops are best for crocheting into the ends of natural dreads for extra length (though tapered tops can also be used for this if you're not great at crocheting) Please see the information below about different installation methods. How do I install these dreads temporarily in loose (undreaded) hair? The most popular and easiest method is to braid (pinch-braid) the extensions in temporarily into loose hair. Braid-in extensions are pretty simple to install yourself if you have clever hands (i.e. you know how to braid) and are good at working in a mirror… it can be helpful to have a friend to help with the back of your head… and some movies to help pass the time! You can also take them to a salon to install, but be sure to call ahead to see if they have experience installing dreadlocks. First, section off a lock of hair (generally a 1" square of scalp). If you are installing a full head of dreads, you may want to section off the whole head before proceeding to make sure you have the correct number of sections for the number of dreads you have and that they are of even thickness. Thread each section of hair through the loop on the SE extension (a large latch hook is great for this), divide the section of hair in two and make a braid, using the extension as the third strand. You can "pinch" the braid and push the work up toward the root as you work if you wish to make the braided part shorter. Once you reach the end of the hair, use a mini rubber band to secure. (For a more secure job, use two rubber bands, one securing the braid up a bit higher. How long can I leave in temporary (braid-in) extensions? Can I re-use them? For braided-in extensions, you will want to take them out and reinstall at least every 2 months (or more often for coarse/nappy hair that dreads up easily). The longer you leave them in, the more difficult it can be to remove if your natural hair starts dreadding up at the root. Also, this will keep them looking nicer and neater as you'll want to take up some of the slack from natural growth and tame any frizzies that have escaped. Simply snip the rubber bands and unbraid the extensions. If your natural hair has begun to dread at the root, rub conditioner into your roots and allow to sit for a bit before gently combing out your hair with a large tooth comb. Some hair will inevitably come out when you remove the extensions, but most of this will be natural hairs that are shed over time. This is a great time to give your hair a good washing and give your scalp a break for a couple of days. The extensions can be given a good washing as well – fill up the sink with warm water and a bit of shampoo or dishsoap and let them soak for a bit. Rinse well a few in a basin of clean water. Lay them out on a towel to air-dry (and re-steam them if they have gotten a bit fuzzy!) You can re-use them for many, many installations - I've had clients re-use the same dreads for years! How do I install these dreads temporarily in dreaded hair? If you already have dreadlocks and wish to add extensions temporarily for fullness or a splash of colour, you can thread the loop of a SE extension over your dread as you would a bead and push it all the way up to the root. Then use a tiny rubber band on just the extension, right up at the root to "close" the loop and cinch it around your dread. How do I install permanent extensions to my existing dreadlocks? Synthetic extensions can be added either to the root of existing dreadlocks for extra fullness or to the ends of existing dreadlocks for extra length. To add extensions at the root, I recommend tapered-top extensions. The tapered top can be threaded through the root of the dreadlock and folded back onto itself and then crocheted and sewn into place. To add length to the ends of existing dreadlocks, either a loose hair top or tapered top can be used. If the existing dread is blunt, comb out the end so there is loose hair to work with. The extension is laid alongside the dread, overlapping, and a tiny crochet hook is used to pull the fibers of the extension through the tight part of the dread and the loose hair of the dread through the tight part of the extension. Keep crocheting the two together until the connection is solid (this takes some practice and quite a bit of time!) There is some debate about the use of thread for sewing in extensions, but personally I find that after crocheting, it can be helpful to run a few tiny stitches with weaving thread in a matching colour through the inside of the connection to keep the work nice and tight. Can I wash my hair with these in? What shampoo should I use and how do I dry them? 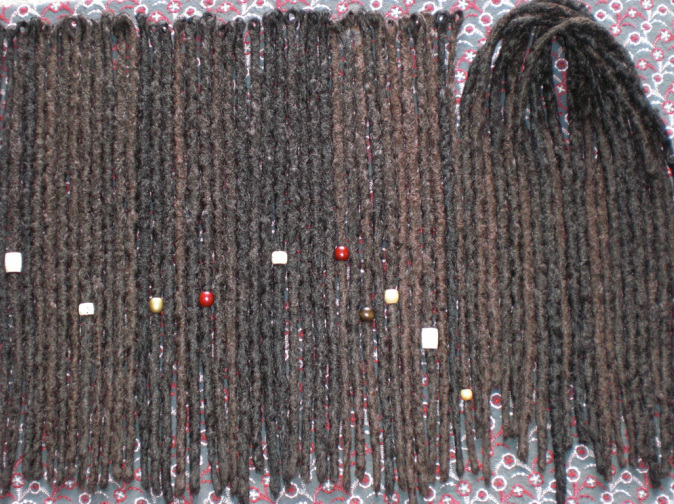 - Unlike human hair dreads, repeated washing will not cause synthetic dreads to lock up more. Wash only when your scalp feels dirty. If you’re accustomed to washing your hair often, try tapering off to let your scalp’s natural oil production adjust to the new regimen. The less you wash, the better for your dreads and the longer your installation will last. - Use a diluted no-residue shampoo (Neutrogena is decent, but my personal favorite is a bar shampoo available from Vital Goods on Etsy) and focus your scrubbing/washing on the scalp area as this is where oil accumulates. Synthetic fiber doesn’t hold dirt and oil the same way as natural hair. You shouldn’t need to soap up the extensions, just let the soap and water from your scalp run through them. Rinse well! - Long extensions can become very heavy when filled with water. Try draping your dreads over your shoulders to support them as you wash – this will take some of the extra weight off of your scalp. - When your hair is clean, gently squeeze the extra water out your dreads and use a thirsty towel to put your hair up in a turban to soak up more water. Leave up for a few minutes and then let them air dry. Hang out in the sun, take a bike ride, or leave your car window down as you drive… this all helps! Make sure your dreads are completely dry before going to bed (wet dreads on a pillow is a recipe for smelly hair and potential mildew)… do yourself a favor and wash early in the day on a warm day! - Do NOT use a hairdryer on your dreads! The synthetic fiber is tough but high heat can cause it to melt… eek! Avoid exposing them to open fire as well. If your extensions become frizzy or fuzzy over time, they can be re-steamed. Hang them from a hook and spritz on a bit of water. Slowly run a straightening iron hair tool on low setting down the length of them. You will hear a little sizzle so you’ll know it’s working (be sure to keep the iron moving as not to singe them). Any stubborn loose hairs can be trimmed. Now they are ready to re-install! Dreads can also be steamed while on your head, just be careful to avoid steaming the rubber bands! Remember, a little bit of fuzz is normal with synthetic dreads as it is with natural dreadlocks!